It has been a few years since I was in higher education at University and I have to admit that I do miss the course structure and even the copious amounts of writing I did. I had a tendency to waffle in fact and often required extra exam paper. Prior to reading my BSc (Hons) in Biomedical Science I enjoyed studying business studies at my sixth form school. It feels like a lifetime ago now. I really had an over-writing habit then, with my handwriting getting progressively slanted as the exam clock ticked on. My description of a budget spanned a couple of sentences when all I needed for 3 marks was "a forward financial plan". Science is definitely something I will return to, but in a few years time when all of my children are within education and I can work the hours appropriate for running experiments which involve keeping cells alive and maintained to get the results I need. For the moment, I am thoroughly enjoying blogging and it has given me another reason to write, often to tight deadlines which I actually thrive on. 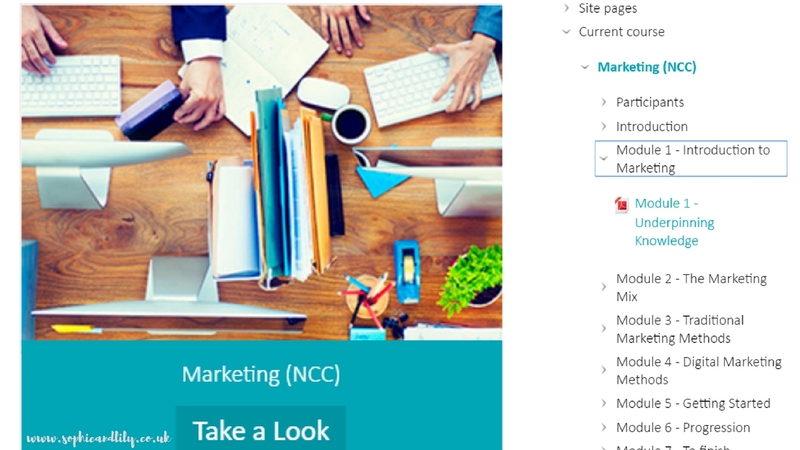 To supplement my education (a resolution for 2016), I am delighted to be able to work with NCC on a marketing course. With my family life currently, online learning home will be ideal for me. I can put my hours into studying when I can and following completion of the seven modules and passing the exam I then receive a certificate. NCC provide a variety of course, ranging from diabetes management, which I found tempting given that diabetes is one of my fields of interest, to fitness topics. A vast range of sectors are covered, so if you are looking for something to supplement your existing knowledge or try something completely new you will be sure to discover something to suit you. I chose the marketing course as it is pertinent to what am doing in the here and now. It doesn't mean that I am abandoning any ambition within science by any means, but simply building and extending my existing knowledge. The courses which NCC offer are affordable and you can undertake your learning at your own pace; they are price-matched and so flexible. More employment doors may open, or even take you in a complete different direction. I am excited to share with your my journey on my marketing course and I will write a full review upon course completion. So far I have become acquainted with the module dashboard which is clear and well-presented. NCC have clearly considered user navigation when designing the dashboard; it is important not to get put off before even beginning the course. Module 1 - Introduction to Marketing beckons. Have you had experience of learning from home? What do you think about it?